So much time is lost in transit, from spending hours in line at airport security to getting stuck in traffic. But Toronto-based design studio Aprilli has cooked up a futuristic solution that could turn those lost hours into valuable time. The firm’s “Autonomous Travel Suite” concept combines the ease and comfort of a hotel room with the power of autonomous driving. Think of it as an ultra-deluxe Uber that you can sleep, work and eat in while you travel — not to mention a bold vision of the future of transportation. 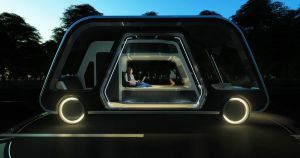 The autonomous pod is a full-fledged transportation solution that is “equipped with the basic sleeping, working, and washroom facilities, allowing the guests to use their travel time more efficiently and productively,” according to Aprilli’s site. You can summon it with an app, and Aprilli sees the Autonomous Travel Suite to be part of a much bigger “network of hotel facilities” where individual pods can dock to offer clients even more amenities. In an explainer video, for instance, you can watch the pod connect to a “parent suite” inside a circular “hotel” that turns the simple travel suite into a much bigger “upscale integrated unit” that includes a washroom and living space. Needless to say, it’s an ambitious idea — we haven’t even figured out how to get autonomous vehicles to reliably share the road with human drivers. And it’s not an entirely unique idea, either. Other companies like IKEA envision the future of autonomous vehicles as not just hotel suites: their SPACE10 concepts revealed in September include visions of a self-driving mini-greenhouse and a pop-up shop. Nonetheless, Aprilli’s concept is a promising idea that could shift the whole paradigm of travel — and make some of the most bothersome hours of travel convenient, comfortable, and efficient. The post Futuristic Hotel Suite Would Drive You Around While You Sleep appeared first on Futurism.